As promised there was cloud and rain this morning, but not too much rain (a little drizzle) although the ground was certainly wet when we woke up. 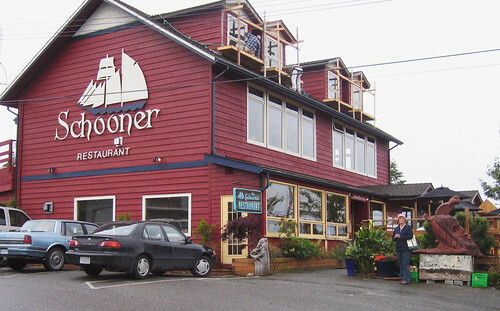 The Schooner Restaurant provided us with a great breakfast — very tasty hash browns and French toast (made from sourdough bread). 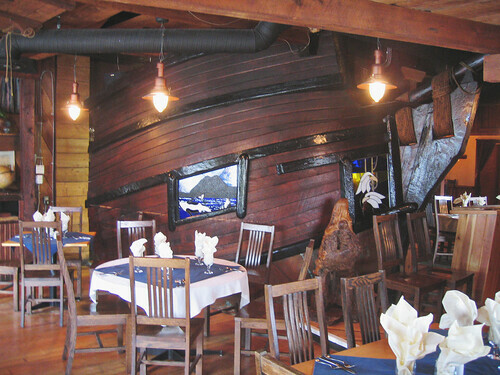 The inside actually featured the hull of a ship — real or fake, I don’t know. Then it was time to browse and shop. 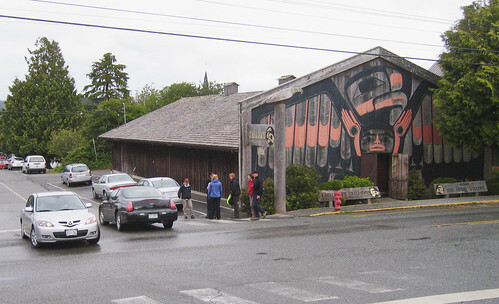 Across the street from the restaurant lay an art gallery, and we found the most amazing art inside —paintings by a native artist, Roy Henry Vickers, much of which seemed to be backlit but wasn’t. So …. I finally fell off my wallet and bought some art cards and a small print. I played with the notion of purchasing the original of the print, but at $12 000, it was a little rich even for my well-heeled, blue blood (ha ha — pure irony there, folks). 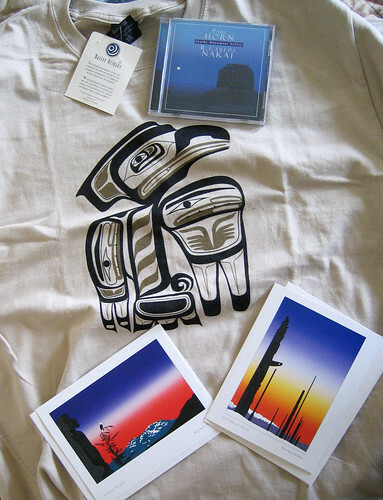 A native store, The House of Himwitsa, was our next destination, and AC fell even further from grace with the purchase of a T-shirt and native CD featuring flute music etc from Monument Valley, AZ. I know that it sounds strange to purchase an Arizona souvenir way up here, but we actually experienced a most haunting and evocative playing-of -the-flute by a Navajo guide deep in the valley last year, so I’m looking forward to perhaps rekindling that memory just a bit more. Here’s a snap of some of my souvenirs. Cuppa didn’t purchase any today, but she has done quite well for herself on this trip, I assure you. No, don’t feel sorry for Cuppa.